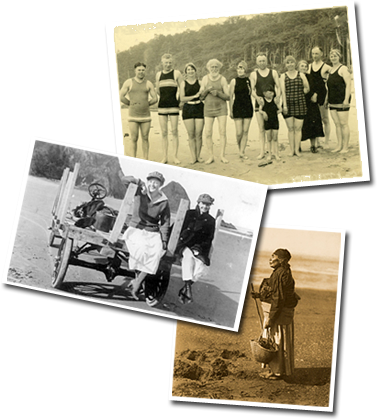 Ever wonder how Cannon Beach got its name? The story is as confusing as most historical rumor wrapped tales, but it is still pretty darn good. From the parcel at Elk Creek, to the town known simply as “Ecola”, eventually became Cannon Beach, but that’s not really the story we are going to focus on. The focus of this story is of the original cannon that was discovered along the coastline in 1898. 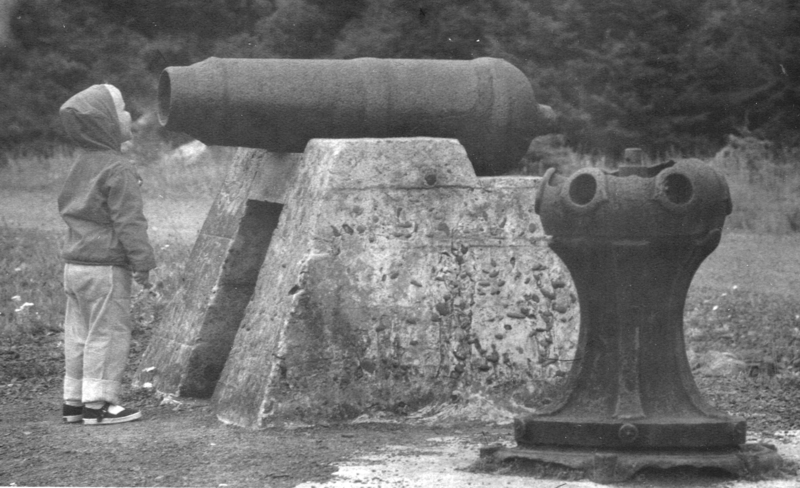 This carronade initially washed up in Arch Cape, Oregon in 1846. Where did it come from? Well, the very first cannon to be discovered in our area was torn, along with a portion of the decking, from the USS Shark. An illustration of the USS Shark. 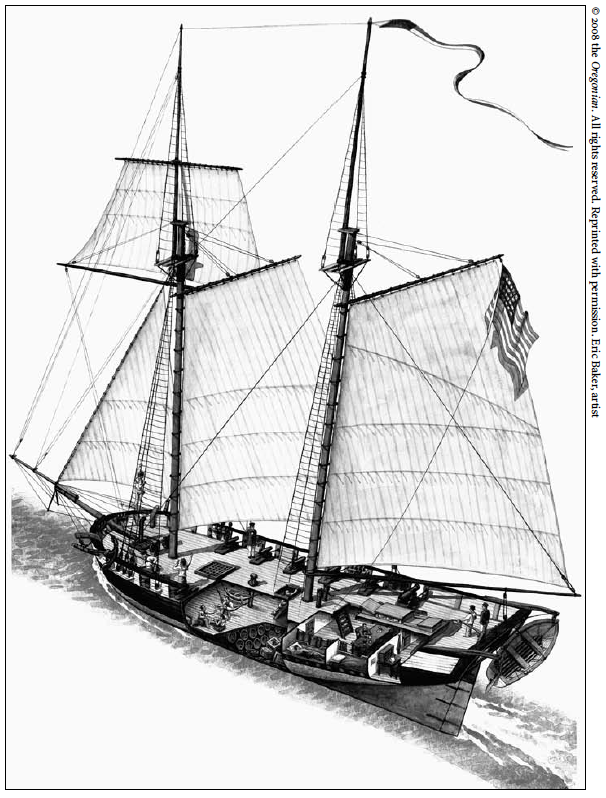 The Shark, a U.S. naval schooner, wrecked at the mouth of the Columbia River on September 10, 1846. During the wreck, Lieutenant Neil Howison ordered three masts chopped down and all twelve (although the exact number of cannons has been debated) of the ship’s cannons jettisoned in an effort to help lift the ship off of Clatsop spit. Before the crew of the ship could take action, the ship began to break apart, and pieces of the wreckage were scattered all over the bar. Despite his efforts, T.J. Simes was only able to retrieve one of the cannons from the piece of the Shark that washed ashore. In a twist of events, the cannon that was retrieved was lost again. However, tales of the cannon swirled. In December of 1863, mail carrier John Hobson reported seeing a cannon in Arch Cape Creek (also known as Shark Creek). Soon after, however, the cannon became lost when tides buried it in the sand. Rumors of the peek-a-boo sightings of the cannon continued to spread. On May 29, 1891, early coastal settler named James P. Austin established the first post office at Arch Cape and named the area “Cannon Beach,” which reflected his hopes of finding the lost cannon. Austin knew that the cannon was supposedly buried in a creek bed nearby, and the settler reportedly spent much time and money on his endeavor to find the lost artifact, no matter how unlikely his discovery might have been. He searched unsuccessfully for the cannon until his death in 1894. 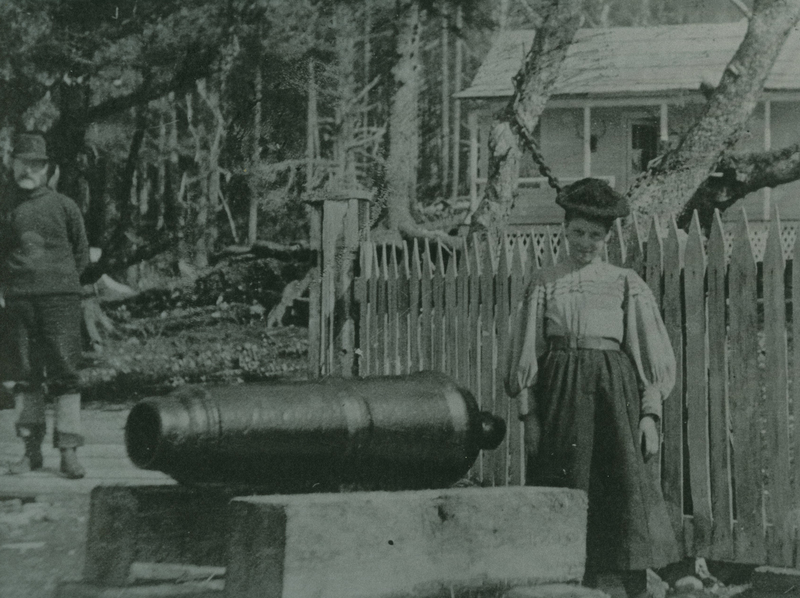 Austin’s wife and the original cannon that Cannon Beach was named for, circa 1898 – 1900. Several years after Austin’s death, mail carrier George Luce spotted the cannon in the waters of Arch Cape Creek in 1898. He ran to tell Austin’s wife, and neighbors John and Mary Gerittse lent their team of horses to pull the heavy item out of the water. Austin’s wife had the cannon placed in front of the post office in honor of her husband, and it was housed there (I believe) until 1945. In 1945, Mel Goodin purchased and platted the land known as Cannon View Park. To make way for home sites the cannon needed to be moved. George Van Vleet, of Van Vleet Logging donated one acre of land to the state on which to place the cannon. The Oregon State Department of Highways prepared a site on the east side of Highway 101. According to an article in the Daily Astorian Mr. Goodin, who was the owner of the cannon, donated it to the public. The cannon and accompanying artifacts were then moved to the new location. How Mr. Goodin became the owner of the cannon, I’m still not clear on. Notice that in addition to the cannon and capstan, there are several other objects believed to be from the USS Shark. This included cannon balls, and other iron artifacts. Theses were believed to be stolen in the mid-to late 1980’s. According to a story reported by the Daily Astorian on April 12, 1989, the cannon and capstan had been repeatedly vandalized. It was because of this vandalism that the Clatsop County Historical Society and the Heritage Museum in Astoria chose to remove the artifacts and put them on display in a safe and secure environment. On April 13, 1989, CCHS Director John Cooper and Steve Kann moved the original cannon and capstan from the Oregon State Highway site to the Heritage Museum in Astoria. As part of an agreement with the Arch Cape Community Club Committee, the Clatsop County Historical Society placed an exact replica where the original cannon once stood. What happened to the original cannon? What happened to the original cannon? Well, after some years the cannon and capstan were given to the fully established Cannon Beach Historical Society with the express understanding that the artifact would be stored with the highest museum standards. The dates are questionable, but it looks as though the cannon arrived at the Cannon Beach History Center & Museum in the mid-2000’s. In 2012, the original cannon and capstan where sent to Texas A&M to undergo a conservation process to stop the oxidation that had occurred during their time exposed to the elements. The cannon, that Cannon Beach is named for, will once more go on display at the beginning of next year at the Cannon Beach History Center & Museum. 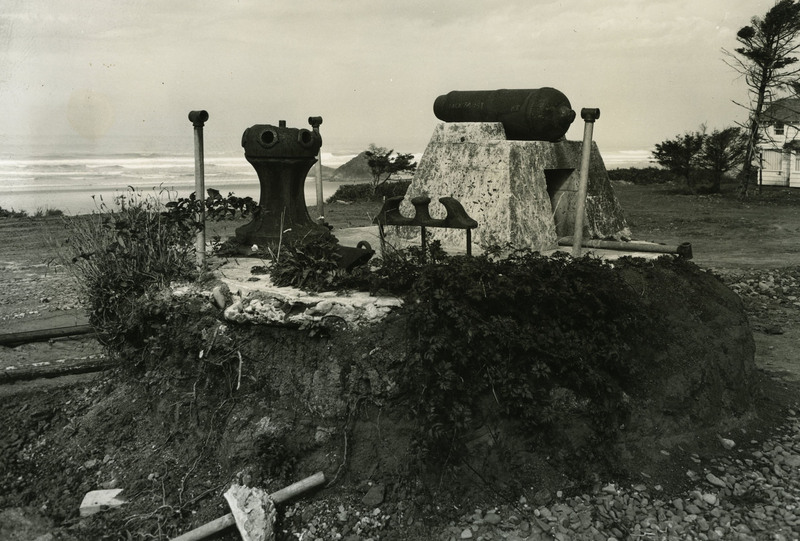 Though the story of the cannon is still sore for some, it is this author’s belief that it is one of the wonders of our coast. From ship hull to the icon of a town and everything in between, that little ton cannon has had quite a journey.